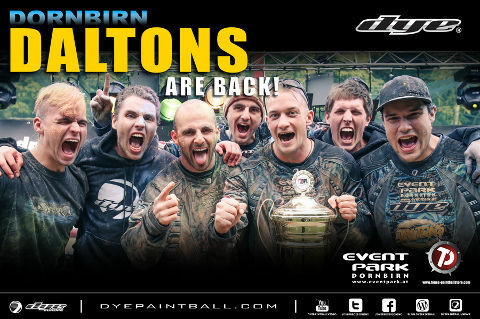 "Our very traditional and also well known Austrian Paintball Team “Dornbirn Daltons” sponsored by “Dye Precision” will compete in the Millennium SPL this year for another time. The Daltons were founded in 1994 by Markus “Mäki” Wohlgenannt. That means we have been on the field for almost 20 years! This makes us one of the oldest Paintball Teams in Europe, maybe even one of the oldest all over the World. When we entered the Millennium Series, they were not even called Millennium Series. Our first event in this league took place in Toulouse in 1997 and was known as the “World Cup Toulouse”. After this, we have been playing the Millennium for many years, competing in Pro Division, Division 1 and 2 and then the Semi-Professional League in which we competed from 2007 until 2009. At the end of 2009 we decided to abolish the international level because some of our “old boys” took a break. Now, after a rebuilding process of three years the Daltons are back, stronger than ever before! The new Daltons team is a mix of paintball veterans who bring a lot of experience and talented, hungry “young guns” with the target to reach CPL level. In 2012 we gained first place at the international event “German Open” and finished the second league of the German DPL in first place. In addition, we decided to play the SPL together with the German team “Roosters Ulm” and now think it is the best time to compete in the Millennium Series 2013 by ourselves. In the 2013 season we are getting great support from our sponsors and partners with which we have been working together for years now. We got a great deal with “Dye Precision”, amazing promotion by Markus & Claudia from the Eventpark Dornbirn and we are also getting great support from Tone´s Paintballstore in Austria. So look out for the very nice and friendly Daltons boys at the Millennium Series, it is going to be a pleasure to see all you guys again in 2013!" "Team Bad Boys Oss is the youngest team in the Dutch paintball scene, with the youngest player being just thirteen years old and already having played Paintball for five years. The average age on the team is seventeen years old and Bad Boys Oss have been playing as a team for three years now. 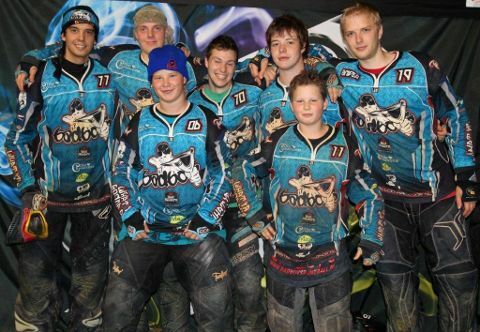 Team Bad Boys Oss began their journey back in 2009 as a kids team that wanted to play for fun at a rookie cup event. After several competitions and winning the tournament in Holland in 2010 as a final push we decided it was time to play at a higher level. Now we are playing the Pro-Division at the NPL in Holland and will be attending Division 1 at the Millennium Series! Our first Millennium adventure started in 2011, when we played the first Millennium event together as team Bad Boys. The event we first attended was the London Masters, with the second one being Paris. We got through the prelims twice but were not able to win the next match. With these results we ended up placed 32nd in the first year we attended the Millennium Series. In 2012, our best season so far, Bad Boys Oss attended the NPL pro series and three out of four Millennium events. We ended up being the undefeated winners of the NPL 2012. With a winning streak of 23 wins and still rising, Bad Boys Oss is on the biggest winning streak in Holland of all time! The second adventure started in 2012. We planned to attend all events that year but unfortunately we had to skip the first event due to exams and graduations. Still, attending three out of four events we managed to end up 8th place overall. With the best event for us so far being Millennium Bitburg where we managed to end up in 3rd place. We managed to get ourselves a spot in Division 1 for the 2013 season! Hoping to keep growing every single day. "We have been playing in Sweden and some random Millennium event during our rebuild years and are now proud to be back playing the Millennium Series. This is one part of our longterm goal. It will be very nice to see all our friends in Europe again! We have to thank all our sponsors that means everything for us! We can play with the best equipment and Wizeguy and Maxs always makes sure everything is top notch for us! If you want to keep updated, follow us on facebook and instagram." We will open registration for both Division 2 and Division 3, for all 4 2013 events on Monday 11th February. Please visit www.millennium-series.com/teams.php?team=register for all information on registration and links to registration forms. There are limited places within both divisions, so please register early to guarantee yourselves a spot! First 2013 event confirmation and location will be announced 10pm CET Wednesday 30th January! Following a very successful 2012 series, which included the biggest tournament event ever held in Europe, we are determined to continue this positive trend throughout 2013. We have been busy negotiating and securing a new and exciting venue for our final event of 2013 ... further details to follow soon! Not only will 2013 see at least one new venue introduced into the series, but we will once again, in collaboration with the EPBF, give national teams the chance to compete in EPBF International competitions, held during our events. Further information will be made available in the coming weeks through the Millennium, the EPBF and your National Federations. We look forward to welcoming you to the 2013 series. Keep an eye on our website, and follow us on Facebook and Twitter where further information regarding venues and registration will be available soon.